If you are starting to plan your first trip to Italy, you’ll be spending lots of time daydreaming about which cities to visit and where to stay. 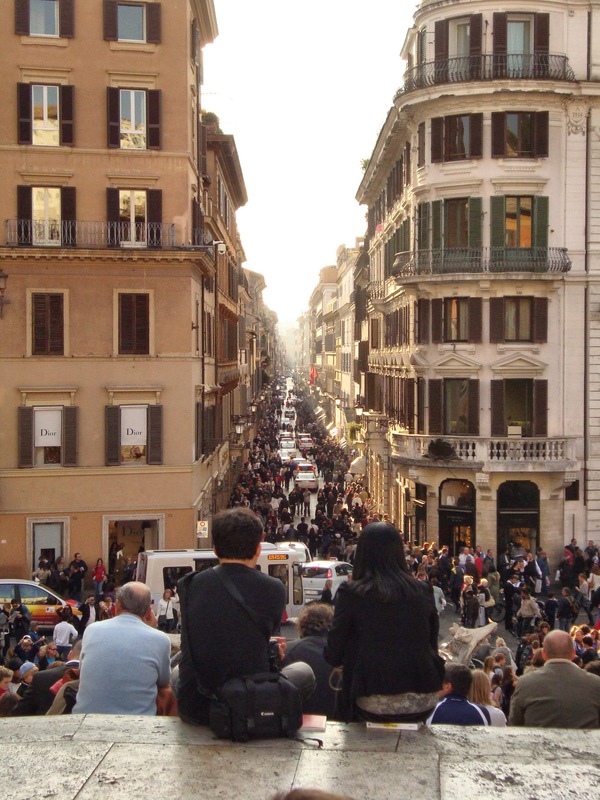 Taking in the view from the Spanish Steps in Rome. About to climb the Duomo and Bell Tower in Florence. Whether you want to visit the romantic Amalfi Coast, Tuscan countryside, Italian lakes, or ancient ruins of Rome, Italy has it all. As your travel dates get closer, you may start to have some questions about how things work and local customs. Below are some practical travel tips for any first timer to the country. My mom thinking about whether she’ll be mustering up the courage to drive around Rome. BY RAIL. Trains are a common form for transportation in Italy. Whether you book a ticket ahead of time or buy one at the station (which is very common), check to see whether it is a high speed train like the EuroStar, a local train that stops at every town. You can get from Rome to Naples in about an hour on a high speed train or 3 hours on a local. If you plan to travel by train, beware of strikes which can shut down the entire grid for a few days. BY CAR. When I’m not staying in a city, I usually rent a car to get around. You can book cars ahead of time on the typical websites. Most cars available for rent in Italy are standard transmission. If you need an automatic, make sure you specifically select it as a required feature. If renting a car, look for the signs that say “Car Hire”. The first time I saw this I mistakenly assumed it was for a taxi or driver. Italians drive on the right side of the road, like most European countries. Driving on the major highways is pretty similar to driving in the US except there is no dilly dallying in the passing lane. If you aren’t passing someone get back over to the right lane or you will likely have someone blowing their horn at you to move out of the way. Be prepared for some windy roads and crazy roundabouts, but between a GPS and your smart phone, you should be just fine. I always like take a small paper map as back up too. I can still remember trying to calculate the exchange rate for Italian Lira on my first visit to Florence. Today, Italy is part of the EU and the Euro is the official currency. This is convenient if you are planning to visit other countries in Europe during your stay. I usually bring a nominal amount of cash with me and then use my ATM card and credit card like I would here in the US. ATMs are typically stocked on Mondays, so if you leave arrive during the weekend, its good to have some cash on hand as the ATMs may run out of cash at some busy locations. You can go to your local bank and order Euro for free or a small fee. Before leaving, contact your bank and credit card companies to notify them of the dates you will be traveling in Italy to make sure they note in their systems to avoid any possible holds on your account for fraudulent activity, and ask for any special international numbers you can call if you need assistance while abroad. Check out the exchange rate before you go too. The Euro was tending exchange much higher than the US Dollar for a number of years (for a while, $1 Euro was close to $1.30 US Dollars) but the two have evened out a little bit over the last couple years (now, closer to $1 Euro equals approximately $1.10 Euro). Ask your cell phone carrier about what plan makes the most sense for you. The majority of cell phones from the US will work in Italy, but they will be much more expensive for to use in Italy unless you get a temporary international plan. Most carriers will let you upgrade your plan for your month of travel and then let it drop off again the following month. Check your monthly usage to estimate what you will likely need for your trip. Some carriers are now offer unlimited texting with international plans, which is a great alternative to spending an arm and a leg on minutes you might not use. Many apps run in the background of your phone, so I typically turn roaming data off and/or set my phone to airplane mode unless I need to access it. Mapping functions will also use a lot of data. A few years ago my husband refused to get the international data on his phone. One morning in San Remo he went across the street to bring the car around to the front of the hotel, but had to circle the block because of a series of one-way road. Unfortunately the GPS was with me in the lobby. About 30 minutes later somewhere close to Monaco he finally gave in and turned on his phone to find his way back, to the tune of somewhere near $400. Lesson here – don’t scrimp on the plan, it will pay off. Also, Italian’s answer the telephone by saying “Pronto”. Italians don’t drink large volumes of coffee, its generally smaller and stronger. They don’t linger around in coffee shops all day enjoying one extra large minty mochachino chocolate chip milkshake after another. Italian coffee is he real deal. It is stronger than anything in the US, and is more comparable to US espresso than coffee. If you want an authentic Italian coffee experience, stand at the bar. Depending on the shop, you either call out your order and then walk to the register to pay, or pay first and bring your receipt to the bar to pick up your order – watch what other folks are doing and take their lead. You will hear the lots of clanking of tiny spoons in small coffee cups as all the locals stand at the bar quickly knocking back their shots in 30 seconds or less. If you chose to sit down at a coffee shop, the prices can be a little more expensive. Also important to note, a coffee shop in Italy is called a “Bar”, so you can tell all your friends you hit the bar every day by 8am on vacation. At the Belmond Villa San Michele in Fiesole, overlooking Florence. – UN UOMO– Gentlemen wear pants more than shorts, even in warm weather. If you opt for shorts, try to steer clear of athletic shorts from Nike and opt for dressy ones. A few button down shirts are always good in the suitcase, along with a smart blazer or jacket. Fitted men’s pants are even more common there in the US, and if you really want to dress the part, embrace the man scarf and consider picking up a pair of red pants. – UNA DONNA. Somehow Italian woman have a superpower where they can dash across a cobblestone streets in stilettos like they are wearing running shoes. This has always fascinated me. I reserve my high heels for limited jaunts to and from restaurants in the evenings. In the cooler months, opt for stylish and comfy boots for day walking, and in the summer a smart pair of sandals are a great option. In warmer months, a sundress and a pair of sandals will do the trick for most any occasion; however, some churches and cathedrals still require women to cover their shoulders for modesty, so bring a scarf or cardigan along. Playing in the garden at the Belmond San Michele in Fiesole. – Plan a smart itinerary. If you have little ones, plan a more low key trip with time built in for running around in grassy areas and to just chill out. 10 hours a day in museums is tough on anyone! – If you have a long flight there, try to avoid lengthy drives the day you arrive. I learned that lesson after packing Max back into a car seat for a drive from the Milan Malpensa airport to Florence following a 10 hour flight from Miami to Milan. He was a good baby, but that was one tiring drive! – Most hotels will have cribs or pack and plays for rent. – Consider renting a small apartment so you have a kitchen to make life a little bit easier. – There are lots of cobblestone streets and stone paths, so bring a stroller that’s up to the task. Some of the inexpensive umbrella strollers can be pretty difficult to push. Consider taking something a bit more durable. We also found it to be easier some days to just wear the baby carrier, especially when going through a busy marketplace or climbing stairs. – Be aware that many public restrooms don’t have changing tables, so be sure to pack a changing pad and change your little one standing up, on a bench or on the floor. – Let them try gelato. Max was a huge fan! The Roman Forum in, you guessed it, Rome. Where is it?/Where? – Dov’è? How Are You ? – Come Stai ? Don’t miss exploring the Mercado Centrale in Florence. In addition to the vendors downstairs, they have a huge food court upstairs! One of my favorite things to do when visiting Italy is to go grocery shopping. The cheese, meats, wine and pasta are all as good as you dream about, and then some. Even the sandwiches in the gas stations are delicious! But a few quick pointers will help you navigate the local customs. – Traditional breakfasts are usually pretty light, consisting of espresso or cafe latte and some type of pastry. At hotels you will find more larger buffets with meats and cheeses. – For lunch, grab a sandwich (“panini”) or piece of pizza. – No early bird specials here. Most Italians eat dinner later in the evening. Many restaurants are open from noon to 4pm, and then closed until dinner around 7pm. – Traditionally, Italian dinners are ordered in courses, consisting of antipasto, first course of something like pasta, salad, or soup (“primo”), second course of a meat, fish or vegetable (“secondo”), desert (“dolce”), coffee (“caffe”), and to cap it all off, a Disgestivo. No worries though, you can pick just one thing from the menu to order. – When you order water, specify whether you want regular/still or sparkling water. “Con gas” (with gas) means sparkling water, and “Sin gas” (without gas) means still water. They will bring you a bottle for the table. – The house wine is usually amazing. Red wine is “Vino Rosso” and white wine is “Vino Bianco”. – Tipping isn’t standard in Italy as in the US, so you don’t need to necessarily include the standard 15-20% tipping protocol that you would in the US, however, no one would be offended if you wanted to tip a good server a few Euros for good service. – Be sure to try the food of the region when you are visiting, and the gelato and pasta will be great regardless of where you are headed! You’ll find more hearty meats in northern Italy, more seafood by the coast, truffles in the Piemonte region near Turin, prosciutto near Bologna and Parma, limoncello along the Amalfi Coast, gelato (in the north) and sorbetto (in the south), and Naples is the birthplace of pizza. – Try some paprika flavored Pringles, they are my favorite snack! Just around the bend from Positano on the Amalfi Coast in southern Italy. If you need help planning your dream vacation to Italy to savor the best of la dolce vita, check out the travel planning services of Travel Italian Style for authentic and personalized experiences in Italy.